The face of America’s energy grid is changing rapidly with the constant addition of small-scale solar panel installations. But due to a lack of detailed information, that portrait looks more like a Picasso than a Rembrandt. Earlier this year, the United States hit a benchmark of one million solar installations, generating enough electricity to power 5.7 million homes. That number is expected to double in just two years. While these data are tracked on a large scale—states provide information to the federal Department of Energy roughly once per year—there is little information about exactly where solar energy is being adopted on a county, city or neighborhood level. This is an oversight that the Department of Energy and other government agencies are turning to researchers to fix, including an interdisciplinary group at Duke University, led by Leslie Collins, professor of electrical and computer engineering and biomedical engineering at Duke. Regulatory agencies would like to get out in front of this shift toward distributed power generation, if possible. With precise data about where solar energy is being adopted and how it is changing over time, officials could predict where to install new technology to meet changing demands. Social scientists could get a better understanding of how policy affects the adoption of solar panels. Economists could better value the future of the 8,000 solar companies employing more than 200,000 American workers. At present, however, the only way to get this information is to go through the local public utility commission interconnection records, which is a tedious and not easily automated task. Alternatively, one could enlist the help of a group of students to pore over satellite images and pick out solar panels by hand—also a tedious task. But that’s exactly what Collins and Bradbury did through the summer Data+ Program and an ongoing Bass Connections project. Data+ is a 10-week summer research experience for Duke undergraduates interested in data-driven approaches to interdisciplinary challenges. Bass Connections is a program at Duke offering grants to interdisciplinary collaborations. 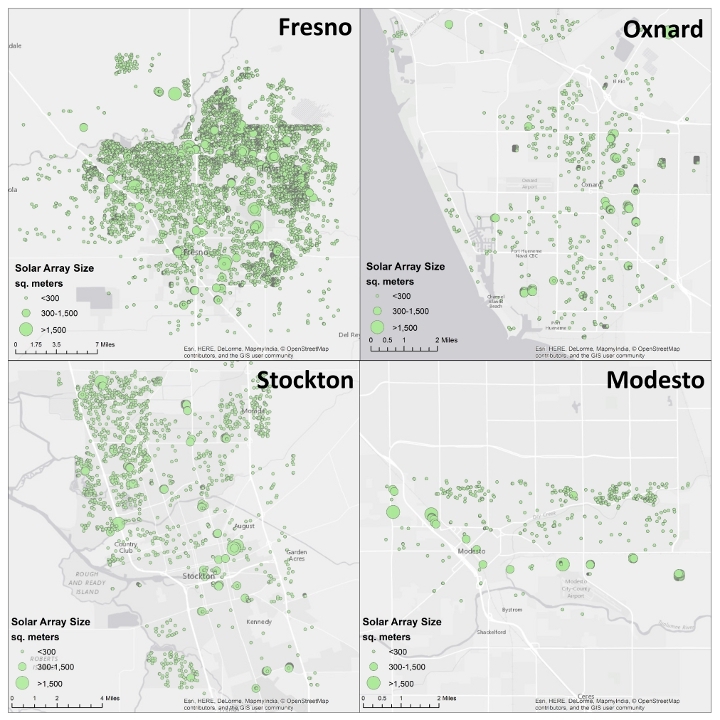 In the Data+ project, students built a data set to train computers to spot solar panels by meticulously annotating 58 square miles of satellite imagery of Fresno, California. That dataset formed the foundation for a Bass Connections project where students explored real-world machine learning techniques applied to relevant energy questions, including the hunt for solar panels. And luckily for everyone, the summer spent circling solar panels appears to have been enough to train a computer to do the job. To teach computers how to spot solar panels, Malof is turning to “deep learning”—a buzzword in computer science circles. The idea is that if you give a computer enough examples of what solar panels look like from the sky and compare them to similar photos where there are no solar panels, the computer can teach itself to distinguish between the two. According to Malof, it’s almost like developing a synthetic visual cortex—the part of the brain that processes visual information through several consecutive layers of neurons. In a deep learning project, the trick is to pick how many layers to incorporate and how many connections to put between individual “neurons,” among other factors. The whole process involves turning different knobs and trying different settings to try to optimize the results. With a dataset of 20,000 individual annotated solar panels and 100,000 image chips covering 1.5 billion pixels of satellite imagery from the U.S. Geological Survey, Malof is starting to get dialed in. As the research group continues to make improvements, they plan to expand their efforts beyond solar arrays.